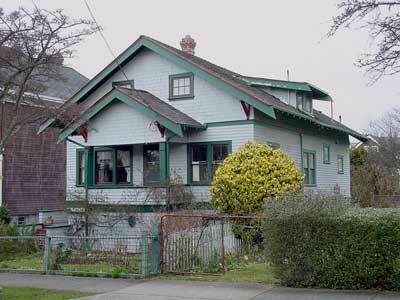 This 1½-storey, front-gabled Craftsman house has a low, shed-roofed dormer on the right side, wide eaves and exposed raftertails. The shingled front gable has two brackets on either end and two square six-light windows. A string course around the house separates the upper shingled area from the main floor. A small cantilevered box bay with a wide roof is located above the beltcourse on the left side. A centred, gabled front porch has square posts and mimics the design of the front gable. The body of the house and the balustrade are clad in bevelled siding, while the stepped stair balustrades and basement are shingled. On the front and left side are five geometric stained glass windows. The house has two corbelled brick chimneys. James Porter was probably the James Porter, retired, listed at 62 Government St in 1911-12 CDs. 1913-26: Harry Charlesworth (b. ENG c.1884-1944) and Mable (née Dickinson, b. ENG c.1889-1961) newly-arrived from England after their marriage in Crewe, bought the house for $6,600. They were going to Australia, but stayed here instead. Harry was a teacher and principal at George Jay and Oaklands Schools, and organist at First Presbyterian Church. In 1926 he became the first General Secretary of B.C. Teachers’ Federation, and they moved to Vancouver. 1928-30: Frank W. Briers (b. London, ENG c.1898-1960) and Margaret (née Morrison, b. Flat River, PEI c.1896-1982). Frank came here in 1915, Margaret was a waitress when they married in 1918. Frank retired in 1957 as City of Victoria Fire Chief, after 41 years on the job. 1931: Colin K. MacKenzie (b. Victoria) and Estella (née Sharpe, b. Sumas, WA) married in Victoria in 1915. Colin was a wheelwright at the time, but later spent many years in BC’s Provincial Police Force. 1937-78+: Violet Francis (née Welch, b. Winnipeg 1899-1983) and Clarence Richard Douglas Ferris (b. Victoria 1898-1966). Clarence was a clerk in the BC government and later a commissionaire until his retirement. He fought in WWI and was a member of the Royal Canadian Legion and Army, Navy and Air Force Veterans.